Of course photography is also banned at this Riad Al Solh site, so I posted some pictures last week through holes in the construction walls. The shots were not that clear so this time I decided to go to the roof. 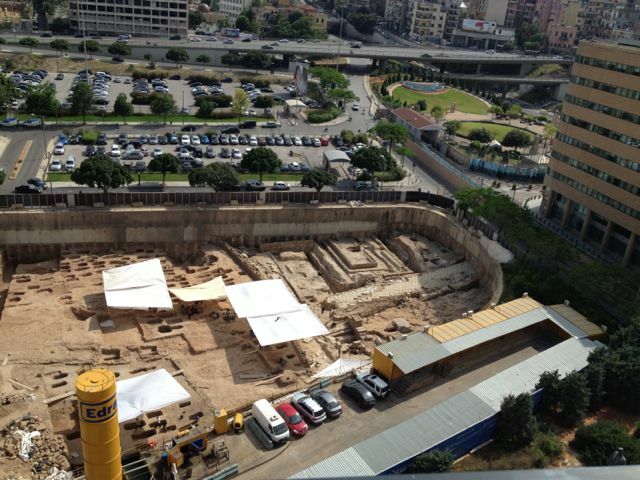 Another fascinating find at this site is what experts believe could be the Roman gate of Beirut. And in the close up of the lower left side, we can see an arch structure. 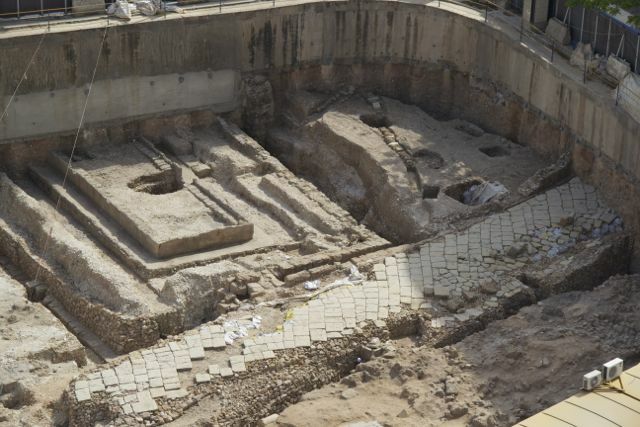 Archeologists believe this could be the first century gate of Beirut, marking the boundaries of the city during Roman rule. 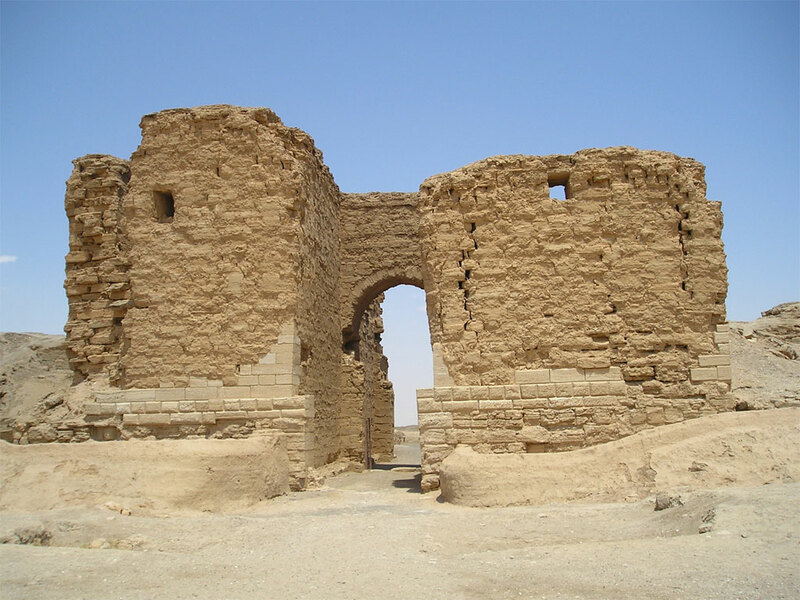 In a previous post I had postulated (through a crack in the wall) that the columns may have supported aqueducts and the lower stones part of a road. But it turns out that was way off and the ground stones are actually the wide foundation of the gate, and the columns are part of its arched entrance. 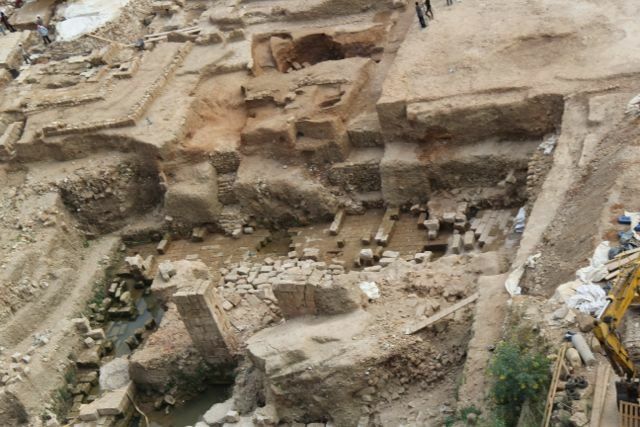 Because the location of the Beirut gate signifies the boundaries of ancient Berytus, archeologist feel it should be kept on site. 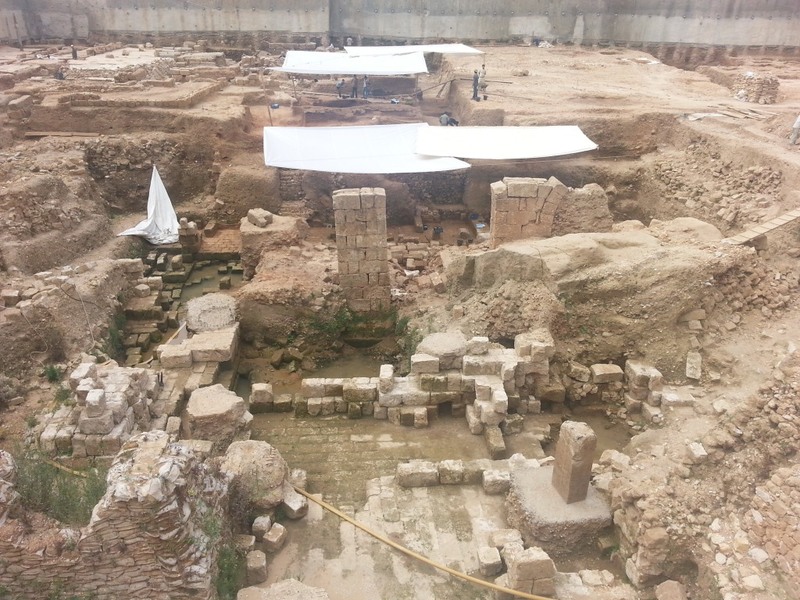 It may be the only marker of the ancient city wall and also too fragile to move. 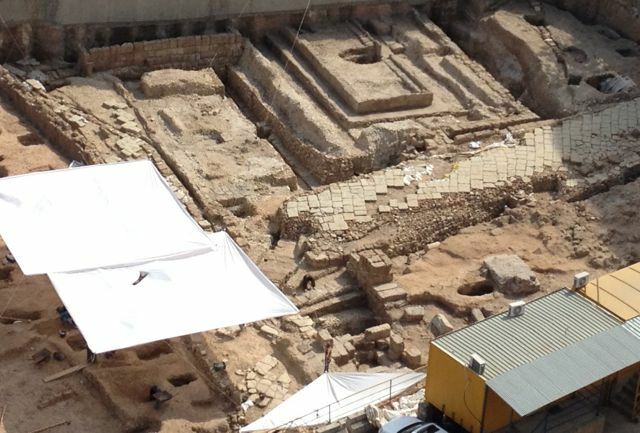 But according to the Daily Star, Culture Minister Gaby Layoun apparently disagrees with archeologists’ in situ position and is in favor of moving ahead with a giant mall and five star hotel to be built on site. I wonder what the project designer, esteemed architect Jean Nouvel, has to say about that. Let’s also remember that Minister Layoun– whose qualifications include “a diploma in engineering” according to Wikipedia– has signed off on a succession of demolitions during his short term, including the District S site (where I was assaulted for taking photos) a mysterious second century BC site and the home of renown Lebanese writer Amin Maalouf. Activists say there is a lot more to be discussed at this site and hundreds of ancient objects that have already been recovered. 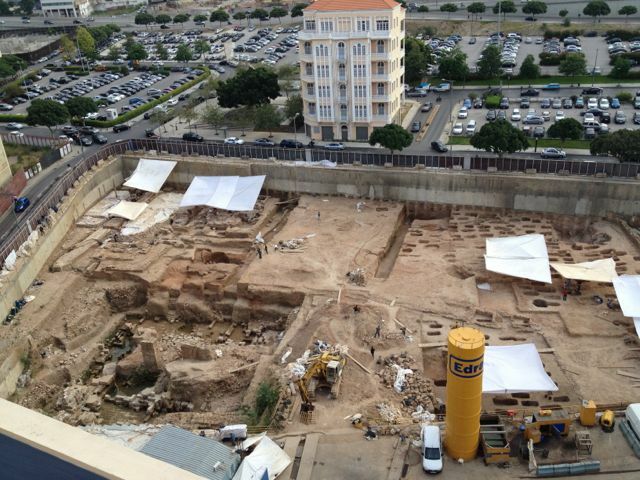 But judging by the ministry’s past decisions it is unclear if archeologists will be allowed to continue their work. 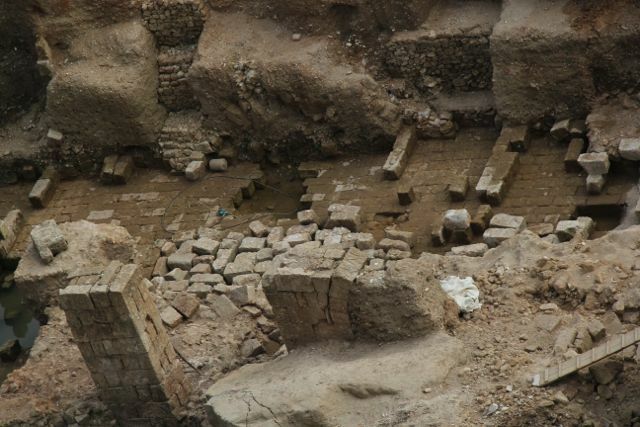 UPDATE: Following this site’s continued coverage of the Riad Solh dig– including a subsequent post documenting what is believed to be Beirut’s oldest church–the minister of culture has announced the site will be preserved and the hotel project stopped completely. Thanks goes to all those who shared and cared about this story! Isn’t there some international archeology court that can stop him? This is ridiculous. Good question. 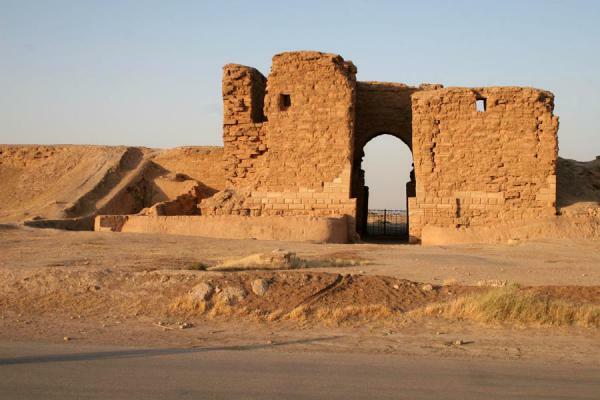 Some have mentioned here that international heritage groups can only act upon invitation by the state. But its worth looking into further. These pictures are incredible. 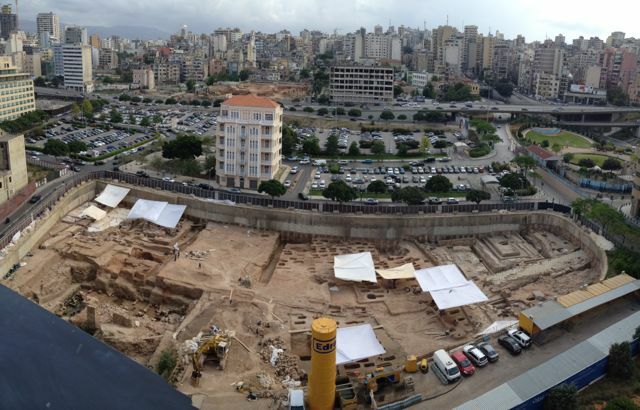 I can remember when the site was still a parking lot, I can’t remember how many times I parked my car there, who knew I was parking atop the ancient Roman ruins of Beirut! 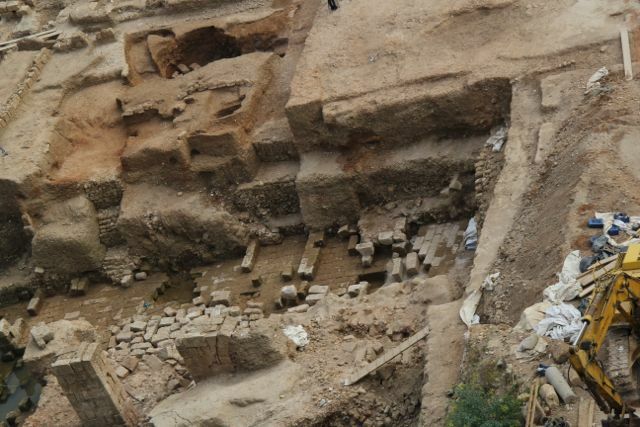 Glad to hear the news today that the site will be preserved, you should be very proud Habib, thanks to journalists and bloggers like you who kept the issue in the media spotlight we may have a fully preserved and intact site for generations to come. Thanks Hani, appreciate your comments. Hopefully we can all be encouraged by the minister’s statement today. All of us can take pictures and demand accountability, the louder and more plentiful our calls, the more we will see results, not just in archeology but in all sectors. I too remember parking in that lot and getting hustled by a guy who used to sell honey there. The valet guys were always a tough bunch as well. Who knew such beauty lay beneath the wheelers and dealers. And imagine where we are parking today!